There's good news...and there's bad news. Here’s a fun little game: Open your Instagram, set a timer for five seconds, and see how many photos you can find of influencers, celebrities, and even your batchmate from high school endorsing hair vitamins and gummies as if they were pure magic. I’m guessing you’d find about a billion. Lucky you. Because for the first time in the history of the universe, vitamins are officially…cool. Or, at least, that’s what social media tells me, and you know social media never lies. But do these beauty supplements, which everyone claims will make your hair grow longer, stronger, smoother, and shine like the light of one thousand iPhones, really work? Or are we all just loading up on a bunch of glorified Flintstone gummies? Welp, the uncertainty ends today, because I went straight to the experts to find out, once and for all, whether or not those hair supplements actually do anything. Allegedly—and I say “allegedly” because supplements and vitamins are not FDA-regulated, meaning brands can kind of say whatever they want to say—hair vitamins revamp your strands from the inside out, thanks to a mix of "hair-friendly" ingredients, like biotin, folic acid, vitamin D, A, C, E, and virtually anything else they want to throw in there. Supposedly, after a few months of taking them, your hair can start to look silkier and healthier and longer, and your scalp's oil production can speed up or slow down, depending on which brand and type of you try. Even though, yes, all of those vitamins are absolutely necessary and beneficial in the creation and growth of your hair, they won’t do much if your body is already stocked with them—which it probably already is. 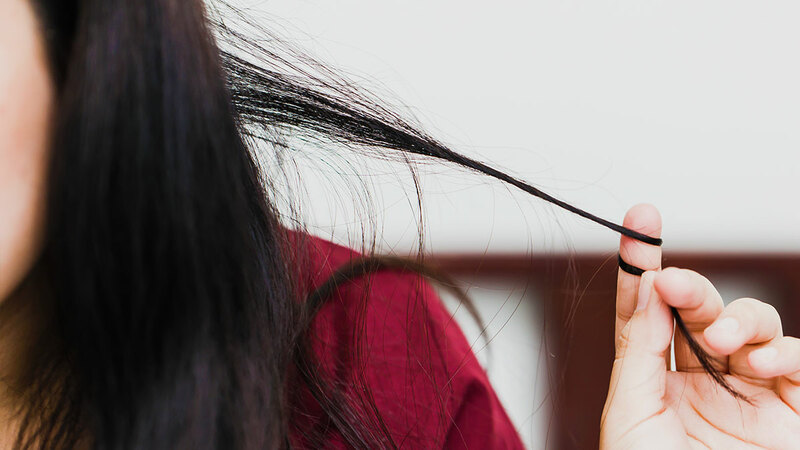 “Most people get all the vitamins they need to manage their hair growth just from their diet alone,” says trichologist Dominic Burg, chief scientist at Evolis Professional. But the more the merrier, right? Sadly, nope. Even if you ingest triple the vitamins your body needs (but, um, don’t), you won’t actually reap triple, or even double, the hair-growth rewards. “Your body only keeps what it needs, and then it gets rid of the rest,” says Burg. So unless you’re actually missing some key nutrients before you take those supplements, you’ll probably end up just peeing out the excess pretty soon after you ingest them. Fun! “There are lot of women running around that are deficient and don’t realize it, because of either dieting, poor nutrition, or intense stress,” says Burg. And when you’re super stressed or not eating enough, “your body will shut down your hair growth first and redirect nutrients and energy to the organs that need it most,” he says, thus leaving you vitamin deficient. And if you’ve ever experienced a severe bout of physical or emotional stress, you might have noticed a sudden shedding of your hair a few months after (or, if not, congrats! You just figured out WTF was going on with your hair). “It’s a delayed reaction to the stress or diet that usually occurs three months later,” says Burg, noting that during this time, your hair may feel thinner, and also look duller and drier. But will they work for you? The only way to know for sure if your body is deficient is to have your levels tested by your doctor, but if you’re, you know, mourning a death in the family while also on a diet, there’s a good chance you’re lacking some nutrients. If you are, in fact, deficient, you’ll likely see some benefits from taking vitamins. In fact, “supplements can also prevent the shedding stage that comes after a period of stress and dieting,” says Burg. So not only will they replenish the low vitamin levels that you have now, but they’ll help prevent them from getting low in the future, along with mitigating any crappy side effects. Okay, but what if you’re not vitamin deficient, and you just want some longer, brighter, thicker, bombshell-level hair, like everyone on Insta? Sorry, but “supplements will probably do very little for you,” says Burg. That’s not to say they won’t work at all, and maybe you’ll be the lucky wildcard, but, if we’re talkin’ from a point of science here, your odds aren’t great. Regardless of whether you’re vitamin deficient or just a healthy, medical oddity who somehow benefits from hair supplements, you won’t see results overnight. Or even in a year. Or in five years. Why? “Your hair is dead, and nothing you do internally can affect its density, strength, or health,” says Burg. “Sure, vitamins will help the new hair that you’re growing, but because it grows only half an inch a month, it’ll take 6-7 years of taking supplements before your new, healthy hair even reaches your shoulders.” Perspective, huh? But that’s not to say you won’t see any changes before 2024. “If you’re deficient, supplements may help reactivate your oil glands after a few months, which can make your hair look shinier and more moisturized,” says Burg. And hey, you might even get the tiniest bit of additional hair growth, but that’s about it. No matter what, you should seriously talk to your doctor before ingesting any supplements, even if they seem harmless. But because I know you probably won’t do that, I’ll at least ask you to only test one supplement at a time (don’t double up; it can be dangerous), and only test reputable, well-reviewed brands (like the best-selling gummies and pills up above). And, most importantly, don’t get your hopes up—not everything you see or read on social media is real, even if the hair looks really, really, ridiculously good.